Melissa showed me this website the other day. I’ve been on a rabbit kick recently by posting a whole bunch of rabbit things on here. I only saw the one item that I’m posting here today on this site, but please do wander around and see if there is anything else. 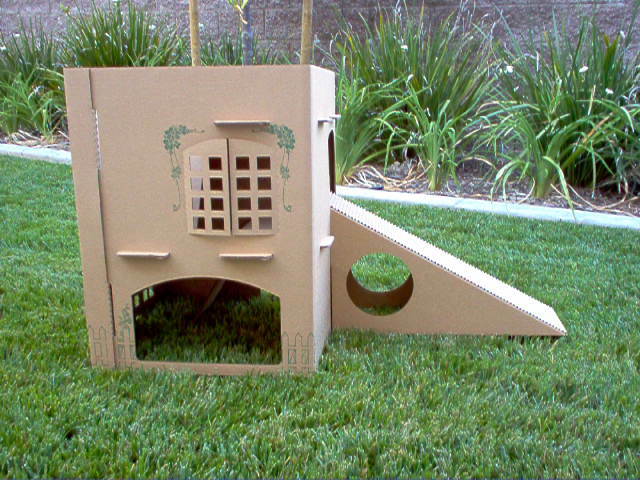 Get the Cottontail Cottage and outer ramp together at a special low price. This ramp hooks up directly to the upper window of the Cottontail Cottage. An extra fun way for kitty and bunny to get to and from the middle floor! This ramp has 6″ holes on each side for run-through fun! (Note: cats and larger rabbits may not fit through this hole.) Wave board is affixed to the top of the ramp to give rabbits extra traction getting up and down the ramp. Ships flat; easy assembly required. The “Wavy Wonder,” which can be cut and glued to internal floors to increase traction, is available separately. I think Peanut would appreciate this for Christmas!